There’s a lot to like about TEEN TITANS: EARTH ONE, Vol. 1 by Jeff Lemire and Terry Dodson. This re-invention of the classic teenage super-team balances the requisite super-heroics with a good dose of teenage angst and soap opera. But it’s hindered by the need to rehash the origins of these characters – variations of their previous incarnations, but still tinged with an overwhelming resemblance to them – and a derivative plot, that bears an uncanny similarity to the core narrative of Marvel Comics’ THE RUNAWAYS. The strength of the EARTH ONE line of graphic novels, at least in theory, is their continuity-free approach to DC Comics’ characters. There has clearly been a line drawn in the sand, however, in terms of how far creators can push these characters beyond their established origins. These ‘reinventions’ and ‘fresh takes’ aren’t overhauls; they’re merely contemporized reintroductions with slight twists; the equivalent of a fresh paint job. Which is disappointing, because given the esteemed talent on TEEN TITANS: EARTH ONE, had they been allowed total freedom, Lemire and Dodson might’ve produced something seminal rather than a fun, but ultimately unmemorable romp. 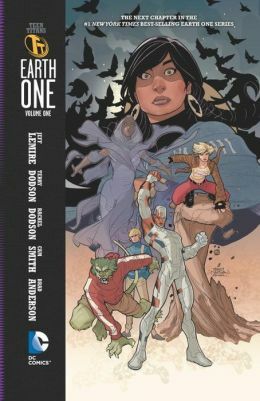 The strength of TEEN TITANS: EARTH ONE is the characters, and Lemire’s pitch-perfect depiction of the teenage cast. Victor, Gar and Tara aren’t typecast in the standard teenage roles: they’re genuine, obnoxious youngsters, who are undergoing a life-changing experience as their powers begin to surface. Their attitudes are infuriating at times, and their initial inability to work together encapsulates the adolescent mentality. But the great character work is undercut by the underwhelming plot; turns out, the people who claimed to love them – their parents – aren’t the protectors the teens assumed they were; they’re bad guys, liars, with nefarious agendas. THE RUNAWAYS, the hit Marvel Comics series from almost a decade ago, presented a similar set-up, and while TEEN TITANS: EARTH ONE isn’t an exact replication, its resemblance is striking. The parents-are-secretly-scrum-bags card has been played umpteen times before, and it’s a unfortunately this story heads down that well-worn and trodden path. Separating the Teen Titans from their parents is fundamental to their character journeys, of course; but surely another route could’ve been taken. Dodson’s illustrations are as slick as ever; the perfect super-hero artist. Lemire’s script allows room for various splash pages, and even a two-page spread, which are all dynamically rendered. Some of the new designs are questionable, but that’s potentially veteran-reader bias, and takes nothing away from the overall package. TEEN TITANS: EARTH ONE is a fine addition to DC Comics’ line of graphic novels, and with a few alternate storytelling choices, it might’ve been something truly special. While it’s not quite A-Grade, there’s plenty to like: great characters, pitch-perfect dialog, and stunning visuals. Readers should look forward to the second volume.